I think the Japanese one is from the training mode of Sword of Seals. Almost there. It's not Gallery 4, though. Just to be sure, I started the game and made sure it's not a case of having multiple correct answers. Sorry. It is a Game & Watch Gallery game, though. Correct. This one is a little bit tricky. With Fire Emblem, almost anything you see in the games can be found online - and this is one of the few that can't. Still no attempt on the third party one? I really am surprised, since it really can be answered with the aid of a search engine. I hate the new forum system. My last edit got overwritten again. Hint: This is a Wii game. Specifically, a downloadable WiiWare title. Hint: It's a Game & Watch Gallery title, but it's not Gallery 4. Of course, Fire is included - and playable. Forget about my last announcement. Next batch of hints will be revealed in around 17 hours from the time of posting if no one's answering. If it's not 4, it's 3. 2 didn't have Fire and 1 wasn't developed by TOSE. Actually, according to NCL, Gallery 1 was made by TOSE as well. But you are correct - the answer is Gallery 3. It's in Secret 2 of the Gallery Corner. It's actually a mistake on my part - I originally didn't intend to make multiple questions of the same game, but since I submitted it, I decided to let it stay. Just like that LCD designer of reverse Fire. This quiz seems to be going well enough that I'll continue it. I'll either avoid impossibly hard ones or give out hints right from the beginning, though. Hint: Search the Internet using the whole line as one keyword block. This is done by putting double quotes around the line. This round will end in around 8 hours from the time of posting if no one's answering. EDIT - Extending for 16 more hours. I'm probably getting too fast-paced. Either everyone feels that it's so easy, it isn't worth answering, or they're too lazy to actually do the search. I fall into the latter, but I did it anyway. Ah, thanks! I thought it was because you guys wanted to really guess, but this particular question is neither obvious nor Nintendo-published (and thus out of the expertise of us NinDBers). Now we can move to the next batch! This next round should be easily guessable. The answers for the Hard questions lie right within NinDB! Next batch of hints will be revealed in 12 hours or longer from the time of posting if no one's answering. I'm guessing the second easy one is The Legend of Zelda: A Link to the Past, and I'm fairly certain the first hard one is Tin Star. The first easy one is Super Mario Galaxy. Everyone got something correct! The only incorrect guess is Nester's answer for the second easy quote. This line is very well known among Zelda fans - anyone who has played a certain Zelda game would find this "feature" annoying. Alright, hints coming. The second hard quote is tricky, though. Hint: From the Zelda series. Fans of a certain Zelda game know this line all too well. Hint: Just because it's in grammatically perfect English doesn't mean the game itself is in English. Next batch of hints will be revealed in 11 hours from the time of posting if no one's answering. Oh, that's from Ocarina of Time, isn't it? that damn owl is burned into my memory. The second hard is a bit of a toughie, though. I know it's about the Nintendo Power cartridge system from Japan, but did that have a special intro with that or something? Because it didn't have any dedicated games I know of. Yes, it's Ocarina of Time. And you're on the right track. It's a Nintendo Power game, and this line is in a sort-of intro screen. 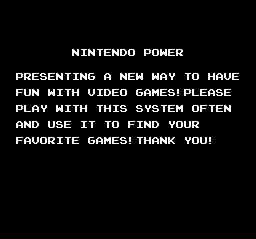 Nintendo Power games don't usually have intros, so in other words, this intro is added in. And like I said, the answer lies within NinDB. So pick your answer here! - The Legend of Zelda: Ocarina of Time; sometimes Kaebora Gaebora ends his long speech with this, and if you pick the default answer, he'll say everything again - and ask the same question again! Hint: Japan only Nintendo Power game. NP games usually don't introduce themselves as such, so this line must be game-specific. Next batch of hints will be revealed... Argh, forget about it, let's just say I'll try to be reasonable. Famicom Detective Club Part II?